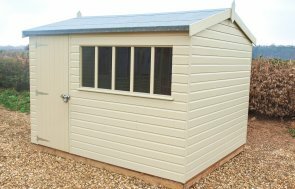 Chalet Summerhouses | Delivery & Installation Incl. 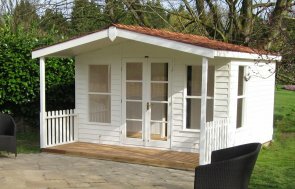 The chalet is a much loved style of building up and down the gardens of Britain. The Blakeney is a real classic design finished to the highest of standards. 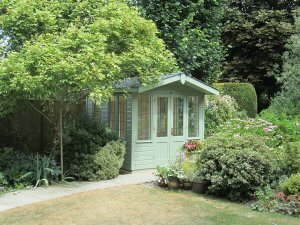 These buildings can be tailored to your needs, whether you want an alfresco dining area for the summer, or you need a hobby room to use all year-round. From 2.4 x 1.8m (8 x 6ft) to 4.8 x 6.0m (16 x 20ft), and plenty of sizes in between. These doors come as standard with the Blakeney and allow more natural light inside, as well as enhancing the chalet feel. 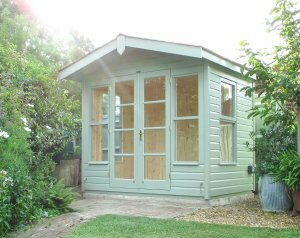 If you are adding a partition to your summerhouse, with external access, you will have a shed door to gain access to your partition. As well as multiple door options, you have also different window options to consider as well to give your Blakeney the look you're after. 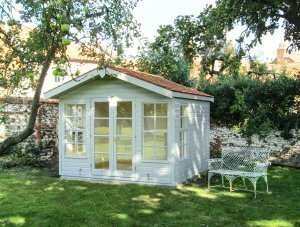 These windows, as with the fully glazed doors, come as standard with the Blakeney to complete the chalet look of the summerhouse. 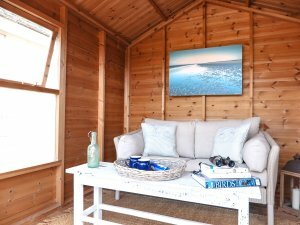 If you want more light or you have another view you would like to see from your summerhouse, you can choose to add extra windows to your Blakeney design. 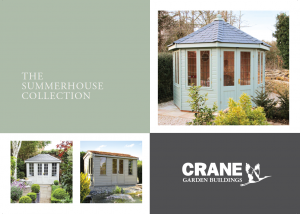 Our Blakeney Summerhouses come with your choice of roof covering: our heavy duty, torched-on felt is the standard material, but you can also choose either Cedar Shingle Tiles or Slate Effect Tiles in terracotta or grey for more of a stylish effect. 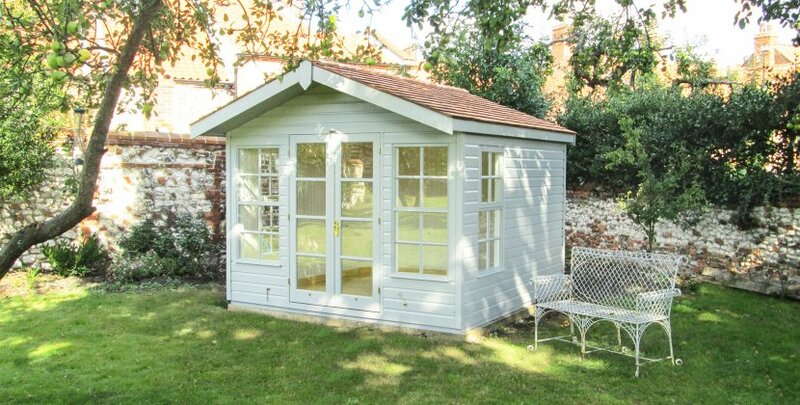 The Blakeney Summerhouse comes unlined as standard for purely summer use, but you can also choose to have lining and insulation in the walls and ceiling. This makes it a perfect all-season retreat and greatly enhances the finished look of the building, increasing comfort and decreasing noise levels. 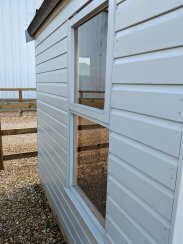 Side Walls - ex 19 x 125mm shiplap or weatherboard cladding on ex 38 x 75mm planed framing, all using high grade Scandinavian redwood. 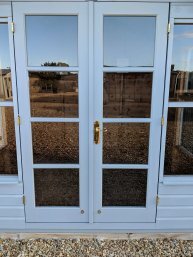 Doors - 1 pair of joinery-made double doors 1830mm high x 1200mm wide, 4 pane, fully glazed with 4mm toughened safety glass, fitted with a mortise lock and solid brass fittings. Windows - 2 or 4 sets of fixed windows fitted with 4mm toughened safety glass in the front gable and 1 set of top-opening windows on each side. With joinery made frames and finished in solid brass furniture. Roof - ex 19 x 125mm tongue and groove match boarding, on ex 38 x 75mm planed framing covered with green mineralised 35 Kg roofing felt. Trusses are used on all buildings 3.6m long and above. Roof Overhang - 400mm roof overhang in the front gable. Looking for a sheltered veranda? 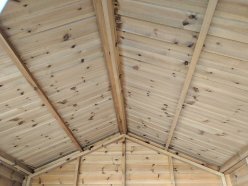 Want a different roof style?